Dennis Beson, has been assist­ing businesses with their company needs in the fol­lowing areas: Soft Skills, Customer Service Training, Business Consulting, and Contract Labor Supply. 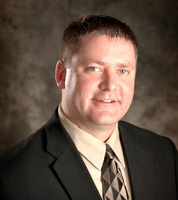 Dennis Beson, a 1992 graduate of Michigan State University is experienced in all facets of sales. He has worked as a Sales Representative, Sales and Service Manager, and business owner of New Edge Technology. Dennis’s new book My Customer, My Co-Worker, draws from his 18 years building an excellent sales and customer service reputation, which based on one solid principle; Treat the customer as you would want to be treated. The program focuses on three principles that over 250 businesses surveyed told us were lacking in their employees: “Reliability, Positive Attitude, and Good Communication Skills”. Dennis Beson uses a unique combination of on-the-job experiences and real life situations to create a fun, stimulating, and motivational train­ing seminar. Each training seminar is fitted to the specific needs in your company. He consults with your company to collect information about your busi­ness and focuses on your desired results to improve overall company productiv­ity and efficiency. Customer service skills, soft skills, and interoffice relations are his specialty. Training is customized to meet the needs of the company based on employees, management, and ownership.